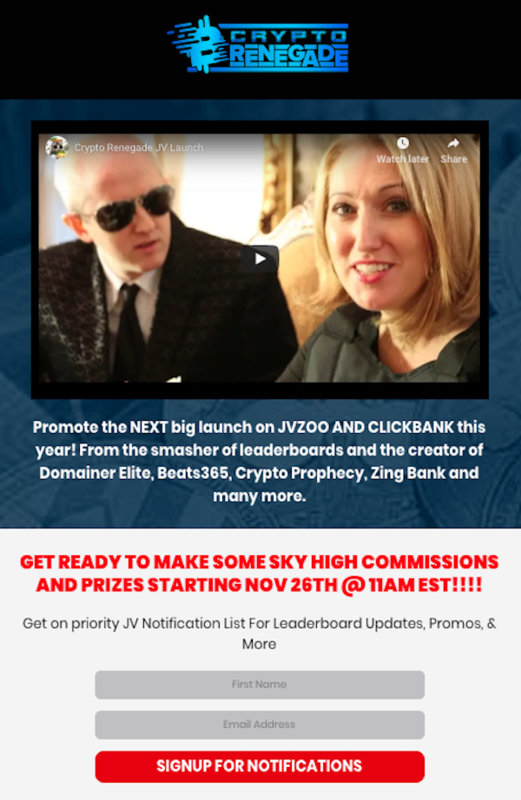 Jamie Lewis, Suzi ‘Cryptogirl’ Lewis + John Halpin – Crypto Renegade Launch Affiliate Program JV Invite, More. Welcome to the JVNP 2.0 Update featuring a primary JV invite courtesy of fellow JVNP 2.0 Partners Jamie Lewis, Suzi ‘Cryptogirl’ Lewis + John Halpin (Crypto Renegade automated crypto trading bot & cryptocurrency education launch affiliate program JV invite), Buzz Builders, and More … in Today’s crypto trading on autopilot edition. …there’s $10,000+ in JV prizes and INSTANT COMMISSIONS available for YOU! Crypto Renegade is a “power packed combo” of cryptocurrency education and an amazing cryptocurrency control panel that allows today’s busy traders to trade on “auto-pilot” a balanced portfolio of the 25 most traded cryptos (a.k.a “set it and forget it”!). In addition to the front end offer for $37 per month or 12 months up front payment for the low, low price of $297, the first upgrade is a collection of Crypto Girl’s personal trade campaigns for $197. The second upgrade is personal training with Crypto Girl via webinar every Wednesday. We’ve seen EPC’s as high as $12.00+ initially from great upsell conversion and our first upgrade converts AMAZINGLY..
Jamie Lewis (a.k.a. “The Singing Guru”) needs no introduction (but here we go!). He’s been CRUSHING launches for 15 years is a MASTER with 8-FIGURES in digital sales. With over $10,000 and a $3,000 “Museum Quality” Bottle of Cognac at stake (with NO minimums)… this is set to be one of the BIGGEST LAUNCHES online this November, 26th 2018 @ 9am EST. Finally … a Game Changer in the Health and Fitness Niche! Join us in the launch of the Self Trainer, a smart device personal trainer that grants it’s user with refined knowledge that comes from years of real training experiences. £10,000+ CASH PRIZES – COMMISSION/50% FRONTEND/ 100% THE FIRST UPSELL AND DOWNSELL. Emmanuel Akinwale – Morbic Athletes – Self Trainer Premium JV page. Frank Garon, John Di Lemme, and other fellow JVNotifyPro 2.0 partners are waiting in the wings … keep your eyes on your Inbox, and follow the action in the JVNP 2.0 Premium VIP JV Announcement archives. Posted in Internet Business + Marketing, Joint Venture Announcements	| Tagged Affiliate Marketing, Affiliate Program, Affiliate Programs, automated crypto trading bot, Buzz Builders, Crypto Renegade, cryptocurrency education, Cryptogirl, evergreen affiliate programs, Find Affiliates, Find JV Partners, Home Business, Internet Marketing, Jamie Lewis, John Halpin, Joint Ventures, JV Calendars, JV Invite, JVNewsWatch, JVNotifyPro, Launch, Launch Calendars, Make Money Online, Marketing, Mike Merz, Need Affiliates, Need JV Partners, New Product Launches, Niche Marketing, Online Business, Suzi Lewis, Work At Home	| Comments Off on Jamie Lewis, Suzi ‘Cryptogirl’ Lewis + John Halpin – Crypto Renegade Launch Affiliate Program JV Invite, More.